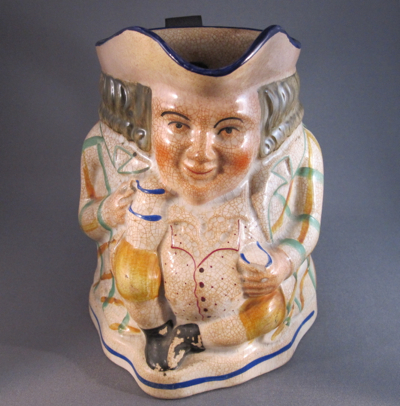 Yesterday I braved the freezing cold weather and made my yearly trek up north to check out the 15th annual New York Ceramics Fair. 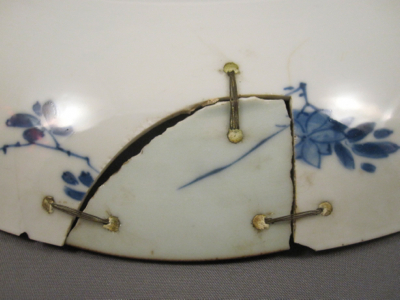 I enjoyed seeing old friends and making new ones, as well as spotting these gems with inventive repairs. 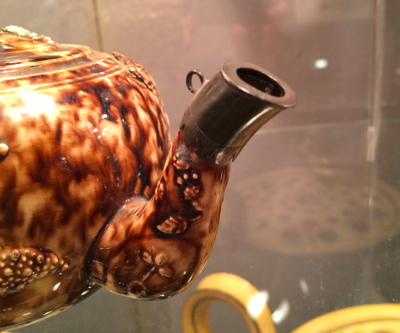 Martyn Edgell Antiques Ltd. brought a stunning collection of colorful mochaware pieces. Sadly for me, they were all in perfect condition. 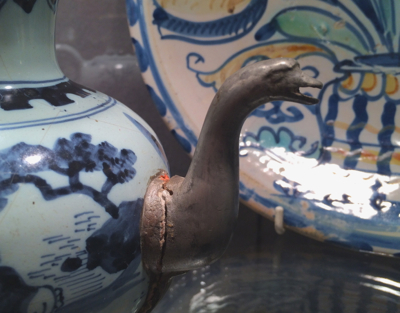 But this important Delft wine pot with blue Chinese decoration from 1680 has an unusual 18th century figural metal replacement spout strapped on to a metal ring around the base. 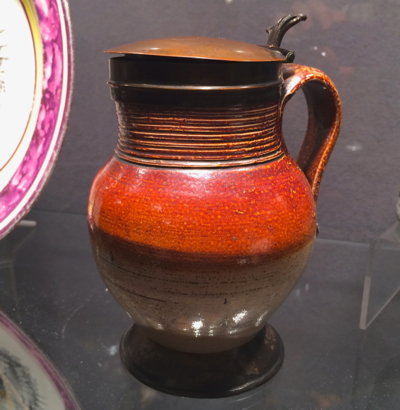 Martyn also brought this English salt glaze jug with copper lid, circa 1700. 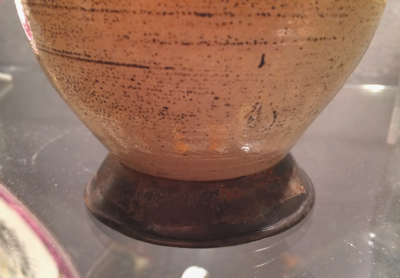 The tin base appears to have been added by a 19th century tinker to stabilize the jug and possibly cover chips along the bottom. 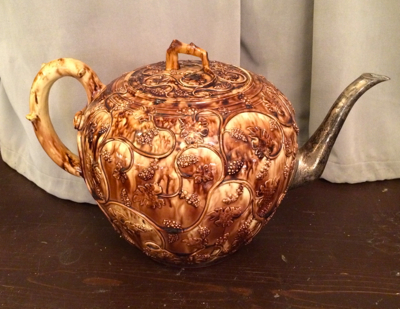 I stopped dead in my tracks when I came upon this enormous 18th century Whieldon-type pottery punch pot, courtesy of Earle Vandekar of Knightsbridge Inc., with gorgeous trailing vines decoration and tortoise shell glaze. 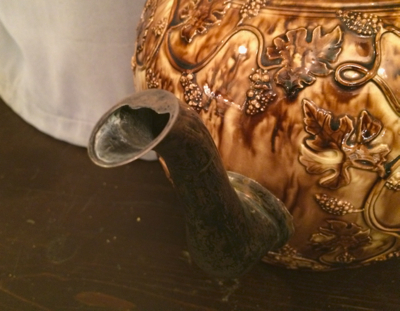 Naturally, my favorite feature is the sleek silver replacement spout, which mirrors the shape of the broken original. 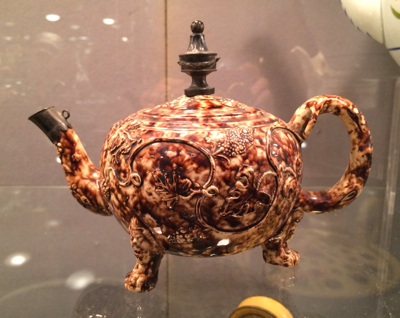 In the same booth I found this lovely 18th century Wieldon-type footed teapot, also with trailing vines decoration and tortoise shell glaze. 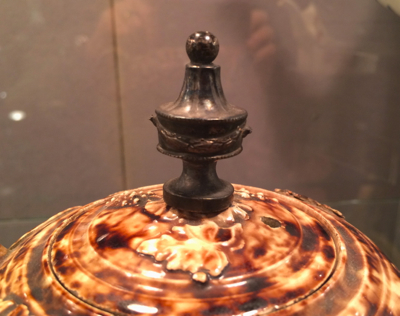 This piece has two early repairs – a silver replacement spout and an overscaled urn-shaped knob. 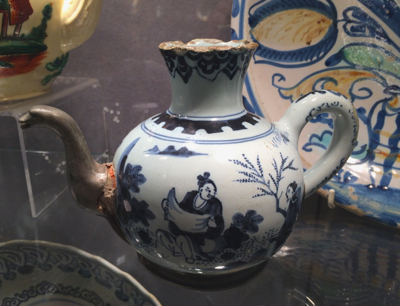 It looks especially appealing displayed next to the much larger punch pot above. 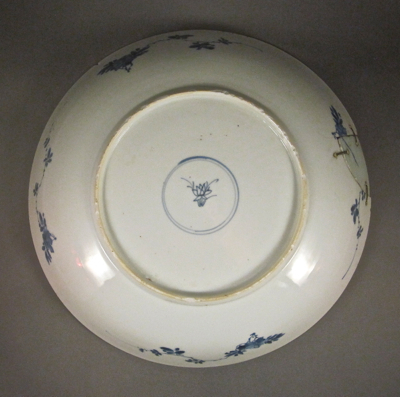 This porcelain plate, which measures 11-1/4″ in diameter, was made in China for export to North America and Europe during the reign of the Kangxi Emperor (1662-1722). 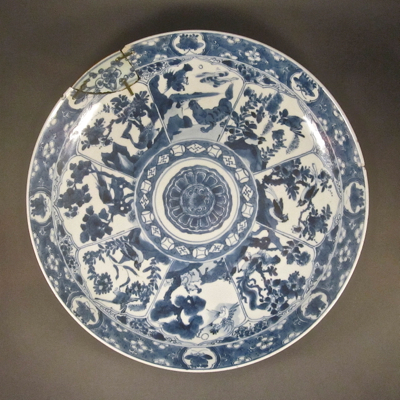 The nicely detailed underglaze design in various hues of blue, consists of 8 panels of birds, animals and flowers, with a central circular motif and a border of prunus and lotus blossoms. 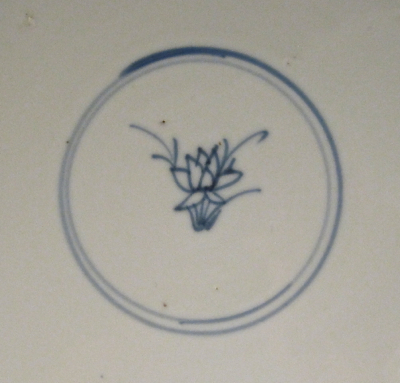 The underside reveals a variation of the Lingzhi fungus mark, which looks to me more like a lotus blossom. 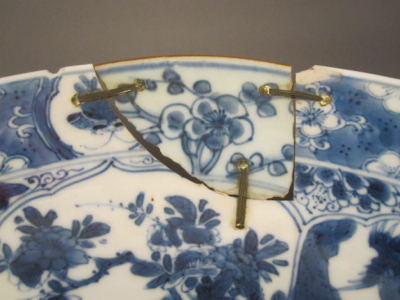 In the 18th or early 19th century, when the plate became damaged, a china repairer smoothed out the jagged edges left by the break and created a larger, more even space to accommodate a new replacement piece – much like a dentist preparing to replace a missing tooth or insert a mouth guard for teeth grinding. 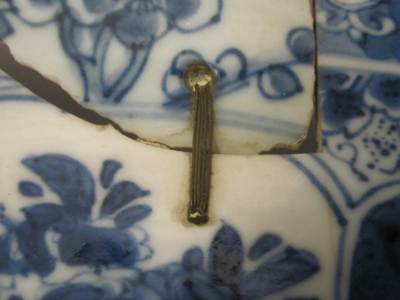 The repairer formed a replacement chip repurposed from a smaller broken plate with similar blue decoration and drilled holes in three places on both the large plate and the chip. 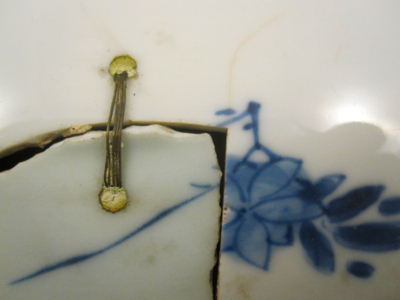 He then used four strands of thin wire to attach the chip and cement to fill in the holes around the wire. 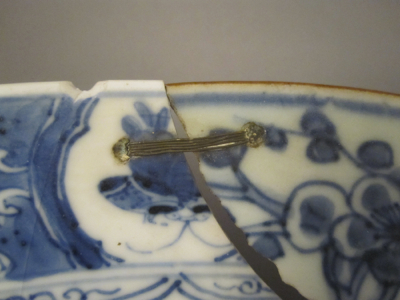 The replacement chip, which is literally rough around the edges, appears to be dancing on the edge of the plate, suspended by a tiny wire harness. 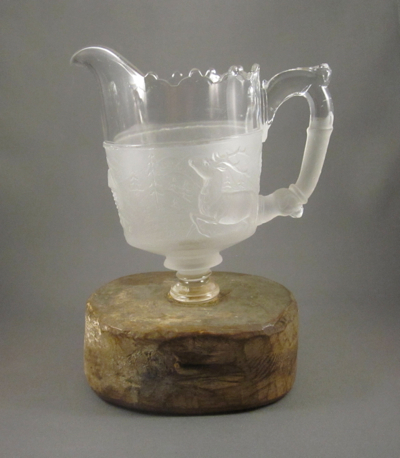 As much as I appreciate gorgeously painted porcelains with exquisitely crafted sterling silver repairs, I also get a thrill discovering stoic survivors such as this humble pressed glass jug. 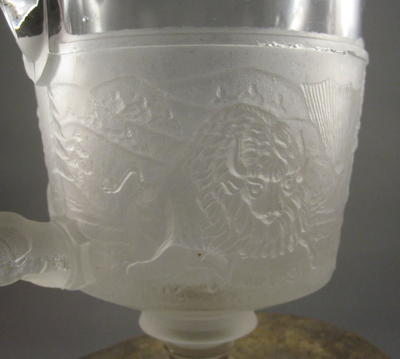 It was made in Philadelphia, Pennsylvania, by Gillinder & Sons in the late 1870s and stands 7-3/4″ tall. 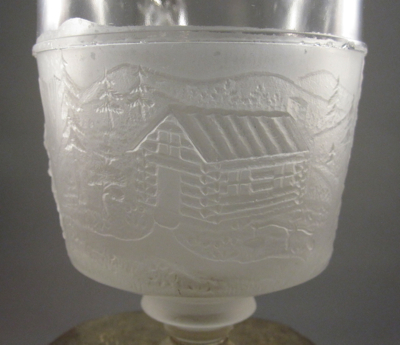 The acid etched “Westward Ho” pattern, originally called “Pioneer”, was so popular with consumers that it has been reproduced many times since its debut 135 years ago. 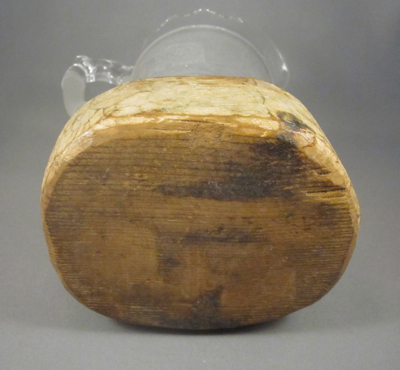 No surprise that in my opinion the best feature of this jug is its 4″ x 5″ clunky wood replacement base, which dates to the early 1900s. 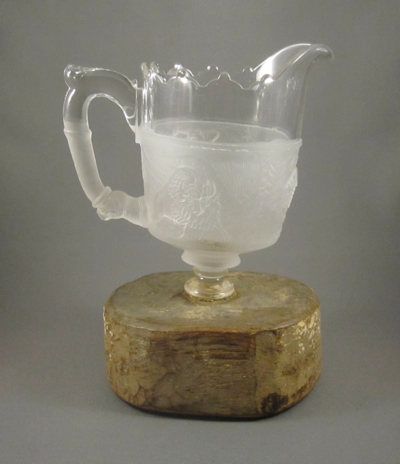 After it was attached to the intact upper body of the jug, it was painted white to appear more elegant. 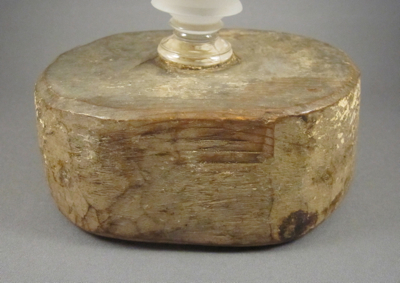 Although most of the whitewash has worn off, a warm patina remains on the out of proportion, crudely carved chunk of pine. 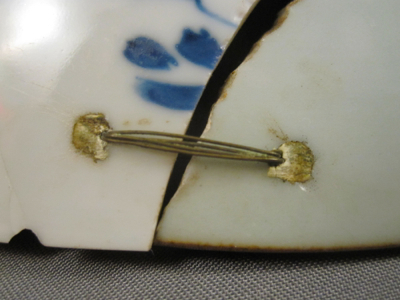 Repairs of this kind were typically done at home using whatever materials were at hand. 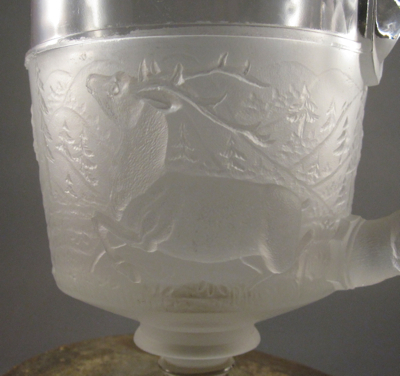 I imagine this jug was quickly repaired at father’s work bench, returned to the kitchen for mother to fill with cream, then brought to the dinner table to be passed back and forth between family members. 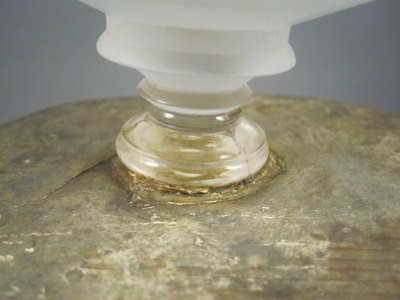 Thanks to this sturdy, no-nonsense repair, it is still able to perform its original function over one hundred years later. 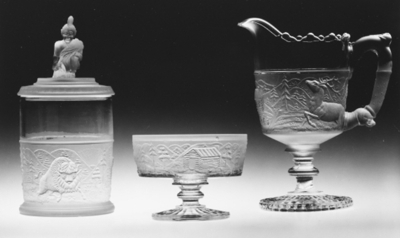 The jug at the right, from The Metropolitan Museum of Art’s collection, shows what the original footed base on mine would have looked like before it snapped off. 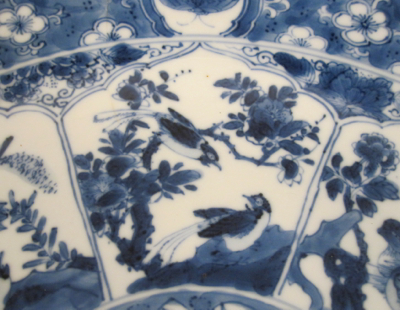 Wishing you all the best for a very happy and healthy 2014!